Certain tag types allow you to define a calculation or program. For example the value of a Calculated Analog Data Tag is defined using an IEC 61131-3 Expression. The configuration tool provides a Text Editor to edit calculations and programs. To edit a calculation, right-click the calculation tag in the Tag Window, and then click Edit Calculation. 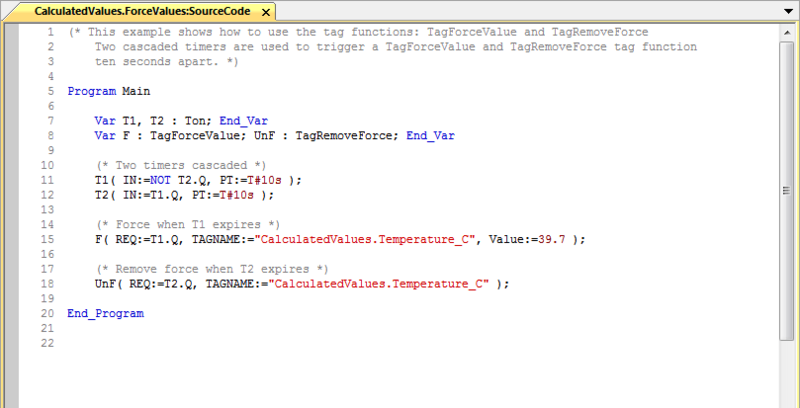 To edit a program, right-click the Program Tag in the Tag Window, and then click Edit SourceCode. Right click anywhere in the text editor window. For information about the commands supported by the text editor.